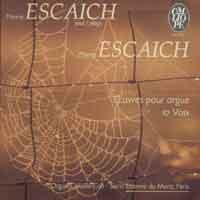 • World premiere: 17/07/1996, Sainte-Marie Cathedral, Saint-Bertrand-de-Comminges (France) – Thierry Escaich (organ). • Commissioned by the Festival de Saint-Bertrand-de-Comminges (France). To listen to Évocation II, please click on a thumbnail. Evocation I for organ carries on the mystery previously illustrated in Motet I. Two distinct elements alternate in the first third of the piece: first of all, an unaccompanied melody, reduced to its essentials like an oriental incantation; then a more chromatic, though still quite ethereal, polyphonic element appears, seemingly evoking the memory of a baroque overture, of which all but the characteristic ornamental and harmonic features have disappeared. These two worlds, distinct at first, move closer and closer together throughout this first period. Then, breaking with previously, a theme of implacable chords carries the piece swiftly and inexorably towards a climax that is much more declamatory, more intense, and where the two initial elements are apparently united. Once again we find the modal melody with its oriental lines penetrated by chromaticisms which create extremely tense harmonic encounters. The piece finally closes in a somewhat unreal atmosphere, giving a clearer glimpse of the resurgences of baroque music, perceived earlier. An inexorable ostinato bass, an almost obsessive C, reminding us of certain dances from sub-Saharan Africa, a persistent and unchanging pedal point, over which fragments of very different worlds form, then gradually begin to clash: a short antiphon Gregorian in line, a strong rhythmic phrase in irregular note values an evocation of fugal polyphony in classical style (but in polytonality with respect to the C of the persistent bass), a psalm by Goudimel with the irregular rhythm that is so characteristic of the motets ‘mesurés à l’antique’, of which the Renaissance period was so fond, etc. The result is a sort of stained glass window so to speak, with certain parts illuminated as the colours swirl and with a constant implacable progression, interrupted only by two short episodes, during which the basis of the Pedal keyboard is lost, as if the ground has suddenly given way, only to be taken up again, all the more firmly, just after the ‘march towards the light’. Unlike the Esquisses, these two Évocations are intended more specifically for classical rather than symphonic instruments. They were first performed in 1996, with the composer at the organ of the church of Saint-Bertrand-­de-Comminges (work commissioned by the Festival).